The latest instalment of the Carhartt Brand Book is here with the much-awaited volume 3. This issue includes the Spring / Summer 2010 Collection in focus, as well as updates on current projects and collaborations, reports on Carhartt’s rich history along with numerous interviews with artists from the Carhartt extended family. On display is a diverse range of items from the Spring / Summer 2010 collection as we offer special insight into the Heritage line while also highlighting the new line of Board Shorts. Highly anticipated collaborations such as the Charge x Carhartt Bike and our latest venture with Vans are also proudly revealed. In spirit of celebrating those who impress us with their work, personalities and passion, we invited some of our favorite peeps to take their place in front of ‘The Black Curtain’. There is a sneak peek at the ultimate record collector’s paradise in London as we swung by Honest Jon’s for a chat with co-label and storeowner Mark Ainley. We asked the multi-talented Juliet Elliott about her perfect day and delved into the artistic approach and mode of expression of Alexander Basile, who shot the advertising campaign for Spring / Summer 2010. Poet and photographer Scott Bourne let his thoughts flow on his deep love for poetry. We got the chance to talk to photographer Gemma Booth about her current exhibition of previously unreleased photographs taken of Detroit ten years ago on display at the new Carhartt Store in Munich and asked graphic designer and illustrator Eric Elms about his artistic development. 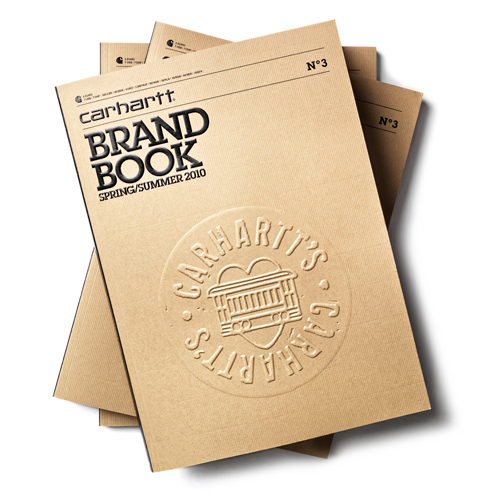 Enjoy Brand Book Volume 3, available now only at Carhartt stores and your favourite Carhartt dealer.